for boys and girls (ages 5-8) June 15-July 15 and take $50 off each player’s registration fee! Family Rate is still applicable for a further $50 reduction of the registration fee! Can you offer any further help with registration costs? Like our buddy Bob the Builder and friends says: Yes, we can! Flex-able payment plans in effect until the school start date. We will work with you to make sure all players that want to take part in our programs; can take part in our programs! We can assist to help outfit your player with a loaner set. SEE YOU ON THE ICE!!! I like the word RELENTLESS, it is powerful, it’s a call to action word, it evokes feeling and passion and best of all it is never ending. A car company has used the slogan, “The Relentless Pursuit of Perfection.” This ties into some of my core values and beliefs. Get better everyday. On my travels thru cyberspace I came across this blog from Mike Van Hoozer. It motivated me today I hope it will have a similar effect on your mindset for today and each day forward. Now that you have discovered this power that is in us all, how will you, use your power? Enjoy!!! When we are distraught because of distractions, we fail to capitalize on the opportunity to impact and lead others. Distractions take us off course and lead us on a detour to a destination we did not intend to visit. If we truly want to lead our families, businesses, and communities, we must become relentless in our pursuit of mentoring others. I have always loved Benjamin Zander’s quote about leadership and the possibilities that exist for leaders. As a conductor of the Boston Philharmonic Orchestra, Zander understood his role as a leader and facilitator of remarkable performances. His role was to bring out the best in others, which began with a belief that each person had talent to be discovered and something of value to be offered. He made himself a “relentless architect of the possibilities” of that person’s potential. Be relentless, holding on to the hope of your role in helping someone develop his or her full potential. They will be so glad you did! What does Brain Navigators Director, Colleen Butler do when she isn’t working with Acres Hockey? An Interview with Colleen Butler: Who Are the Brain Navigators and what do they do? 1) Colleen, what is your exact title and what would you say you do a “Brain Navigators”? I am the Director of Brain Navigators. At Brain Navigators we navigate an Acquired Brain Injured (ABI) person back to living a life that is once again fulfilling and rewarding to the individual and their family. Our goal is to provide individualized recovery packages of practical tools and solutions for the concussed. We provide education for concussions for prevention and workshops for recovering from an ABI. We work both in a group setting and one on one with ABI’s and their families. 2) What kinds of services do you offer? Of course we do the training and education of what a concussion is and the symptoms, at all levels from the medical profession, employers, caregivers, concussed, sport teams. We work one on one to specifically deal with an individual’s needs, restructuring their lives to be productive once again. Knowledge is power! This year we are offering 3-5 day retreats for the concussed providing practical solutions and tools for recovery. symptoms- can you describe some? The symptoms vary as to where the blow to the head actually occurred and the velocity of the hit will determine each person’s disability. Each sport has a different area of the brain which is often unique to that individual sport for example. The brain is 3 pounds of a Jell-O type mass that when hit will slide into the hard bone structure, “the skull” which protects the brain. For example, if I fell forward my brain would hit the front inside of my skull and slide back with momentum the back part of my skull most likely affecting the motor skills as well as the front which is emotions. Symptoms may be: sleep disorders, emotional outburst, speech, i.e. vocabulary, not being able to find the right words, stuttering or talking too much, coordination and movement, depression, unable to make a decision etc. Our brains are our motherboard of our computer, anything which we may see, think, feel, touch or do can be affected with a concussion. 4) What are some of the emotional or social changes you see in people who have had a head injury? Irritability, frustration, depression, withdrawing from society and friends. You are often on an emotional roller coaster where crying when someone greets, or feeling numb or fluctuating from happy to sad. It is really frustrating when you used to be able to do something and after the concussion it becomes almost impossible to do that same task, it is embarrassing. Because the brain has to work so hard to get the messages flowing through the brains’ circuits the feeling of being overwhelmed and tired is a reality. 5) What are some of the behavioral changes often observed in individuals who have suffered a traumatic brain injury ? The behavioral changes are numerous and easily justified as “they are going through a rough time”, or the behaviour changed are confused with adolescence, change of life or menopausal. It is hard and frustrating on the journey of recovery from a head injury, as many things you know have now to be relearnt and it is the expectation of other people that often hurts especially if there is not any obvious physical impairment. It is not a fun place to be! The best thing that does happen with an acquired brain injury is that the individuals are often far more empathetic, compassionate and in tune with their environment. Much of society has become disassociated with their environment, nature and life is valued much more by the survivors. People have been known to do very out of character experiences for example: “R” took all of her money and bought herself a lovely charm bracelet, then went back to the store and bought all the charms she could for the bracelet. What is so out of character is that R had never bought a piece of jewellery for themselves in their lifetime, R spent all of their rent, food and transport money for the month. This was 100%out of character for this budget minded single mother. identify a head Injury with 100 % accuracy. has some limitations- how do you help a spouse deal with those difficulties? a journey. With the right set of tools recovery is possible. and head trauma- what services do you specifically have for them? fight your way through the recovery than to get all bent out on the drugs. 9) Do you have a web site and what would be found there? what we do, workshops, sport concussion, links etc. you see as clients or patients? 10) What have I neglected to ask ? The cost on the system is very high. The true cost of a brain injury is not known, often a brain injury is grouped into mental illness, penal system or the demand on social services as they are unable to keep a job. If left unaddressed or diagnosed improperly which many concussions are the cost are astronomical, putting a tremendous strain on society. There is a high recovery if the caregivers and individuals know they will get better. There is a transition of thinking we are forced into from “doing” to “feeling” … we are no longer robots within the system. People need to seek out others that have had an ABI so they understand what they are going through. not supported well, checking out of society, suicide, living under a bridge or addicted to something not healthy. Recovery must be looked at as making lemonade rather than wallowing in lemons. Dr. Shaughnessy Eastern New Mexico University Portales, New Mexico is currently Professor in Educational Studies and is a Consulting Editor for Gifted Education International and Educational Psychology Review. In addition, he writes for EducationViews.org and the International Journal of Theory and Research in Education. He has taught students with mental retardation, learning disabilities and gifted. He is on the Governor’s Traumatic Brain Injury Advisory Council and the Gifted Education Advisory Board in New Mexico. He is also a school psychologist and conducts in-services and workshops on various topics. Acres Hockey Training and Brain Navigators Concussion-Prevention focused hockey school program is opening its doors to more players. Establishing the Michal Vincent Acres Memorial Bursary will provide players previously unable to participate in “Bringing Smart Play to Hockey” programs the opportunity to receive this crucial on and off-ice hockey specific education in summer 2012. Parkville, B.C. Canada (May 30, 2012)–“Bringing Smart Play to Hockey” programs, the brainchild of Acres Hockey Training and Brain Navigators is proud to announce the inaugural Michal Vincent Acres Memorial Bursary. An opportunity for youth wishing to access a spot in the Acres Hockey Training Summer Schools held annually during the latter weeks of July in beautiful Parksville, British Columbia, Canada. In association with Parksville’s Rotary Club, the Michal Vincent Acres Memorial Bursary will provide an opportunity to players who, due to financial constraints, are unable to experience this exceptional summer hockey school program. It is the hope that this award will help to not only raise awareness of playing smart and safe hockey but also propel eager young hockey players on their road to success in whatever field they choose to pursue in life. Applicants are requested to view the details presented on the website: http://www.acreshockey.com Acres Hockey School age groupings are as follows: ages-5-8, 9-11, and 12-14. A minimum of three (3) bursaries shall be awarded in 2012. 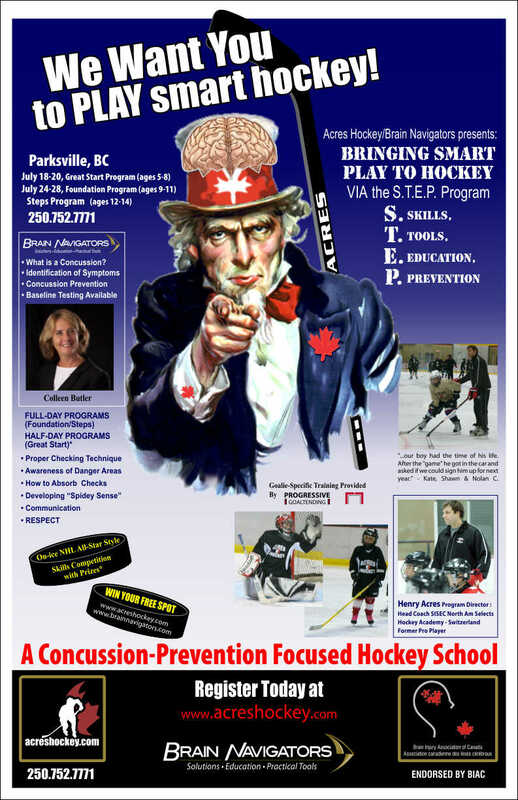 Acres Hockey’s Concussion-Prevention focused Hockey School is the first of its kind. This school provides proven preventative measures to help save our youth from serious brain injury. Acres Hockey and Brain Navigators joined forces in 2011 to create the ground-breaking “Bringing Smart Play to Hockey” programs, where Skills, Tools, and Education for Prevention (STEP) are the focus. Respect is at the heart of this program. On-Ice program is directed by Henry Acres, a former pro-player, now coaching in Europe. Off-ice instructor is Colleen Butler, author of Concussion Recovery: Rebuilding the Injured Brain, international speaker, and founder of Brain Navigators. Significant interest in the Acres Hockey Program has been shown from national bodies in both the hockey and brain injury communities. Acres Hockey 2012 will also feature a shooting clinic provided by Base Hockey including instruction from a former NHL player; each player will receive frame-by-frame video analysis of their shot. Goalie training at Acres Hockey is provided by Progressive Goaltending. Additional mental training program with Dr. Saul Miller via Hockey Tough will be available to all participants. 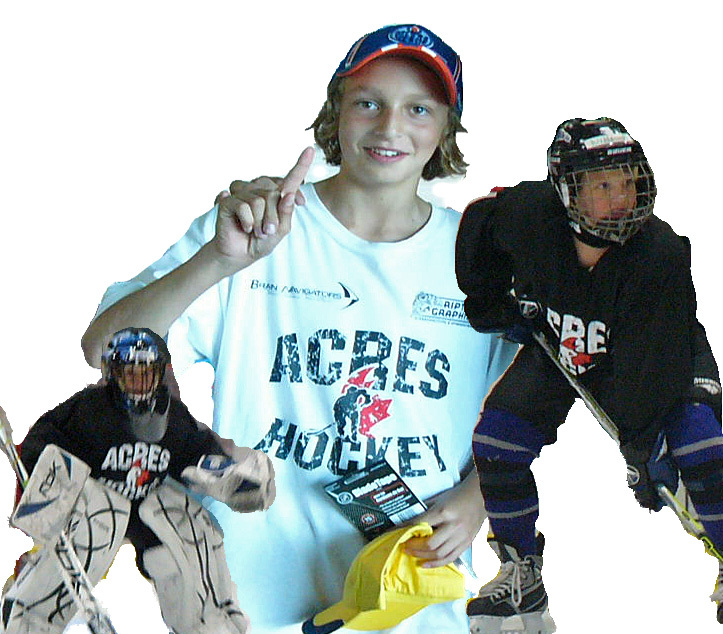 Acres Hockey Training is entering their 9th year of offering outstanding individual and group Summer Hockey Training programs in Parksville, B.C. Canada. Acres Hockey has previously offered programs in Sweden and Finland. Philadelphia Flyers de-facto captain, Claude Giroux and France’s, Sacha Treille were both recently suspended for blatantly targeting the head with hits. Giroux’s was an act of frustration, as he fell victim to his emotions and a lack of control when his team needed him most. Now, facing elimination in the NHL Stanley Cup Playoffs, he is unable to help his team where he is needed most, on the ice. He received only a 1 game ban for this, but it is a very important game. Sidenote: New Jersey has never lost a series they have lead by a 3 games to 1 margin. Sasha Treille’s head hit looked very bad right away as the elbow looks to make direct contact with Roman Starchenko of Kazakhstan’s head. Starchenko was knocked out immediately but did leave the ice on his feet and stayed on the bench instead of being taken immediately to the dressing room. He won’t return to play in the tournament and neither will Treille, either. This brings me to something I have been thinking on the last days. Being based in Europe the head shot issue in hockey is not near as magnified as it is in North America. Of course the big ice helps, less opportunities to hit due to the dimensions of the playing surface. Contrary to popular opinion high-level European hockey is still very physical and there is plenty of hitting. The media hasn’t seemed to blow it up like it has in Canada and the US. This is also due to the fact that the sun does not rise and set with hockey like it is in Canada. Claude Giroux is a product of the Canadian hockey system, thru and thru, minor, junior, AHL, NHL. His comment after the hit was he was finishing his check, “a hockey play.” Yes, he finished his check, no that is not a “hockey play.” It was a selfish act of taking his anger out on an unsuspecting opponent and making shoulder to head contact, possibly late, since the puck had been dumped and the period was about to end. In his mind and worse possibly still he is of the opinion that he did nothing wrong. Sasha Treille, was raised in Grenoble, France, played his minor hockey there, with Cdn coaching influence, moved to Sweden for 2 years and has played the last 2 seasons in the Czech Extra League and is under contract with Sparta Praha for 2 more seasons. A very different hockey make up, very influenced by the French system with tid-bits of other hockey power nations culture and playing styles. After his hit he skates to bench and looks like he is saying/thinking, what was I supposed to do he skated right into me? Two players, aged 24, fully developed but not at the peak of their capabilities I hope. Treille is a big man, 6’5″, 212 and I agree with what his look said to me, the Kazak player set his buddy, Starchenko, up for disaster with his pass, a suicide pass. Treille read the play and stepped up to make the hit, Starchenko side stepped ever so slightly and that put his head into Treille’s elbow as Treille adjusted his arm position to make contact and not get blown by. Giroux is the leader of his team and with his actions, he let his teammates down and while I am a big fan of him as a skilled player, he let me down also. Treille was a big part of the French team, a player who is playing outside his country in one of the top leagues in Europe. He was to be counted on to help his team avoid relegation. He let his teammates down also. It is yet to be determined what wil happen to these 2 players teams while I can only hope these 2 young players can learn from their own mistakes and will think a little further about their actions before and during the next time they are out on the ice. That’s the only way the game will improve safety and respectability-wise. Keep learning from our mistakes and promoting the change in thinking of what a correct “hockey play” is. The game’s best player has been concussed and unable to play for months. Concussions in hockey are serious business needing solutions now. Acres Hockey has joined forces with Brain Navigators to create the first concussion preventative hockey school in Canada. The Parksville, B.C. based hockey schools mission is to provide players with the Skills, Tools and Education for Prevention (S.T.E.P.) via the Bringing Smart Play to Hockey program. A program endorsed by the Brain Injury Association of Canada. The core message of Acres Hockey 2011 running July 18-20, July 24-28 for players aged 5-14, will be respect for opponents and the rules of play, fused with providing education for brain injury prevention. “We have the ability. We must do better as coaches. We must change our focus.” says Henry Acres-Program Director of Acres Hockey Training. “Basic skills training must take precedence in our youth hockey to help players thrive and enjoy the game after the age of body-contact introduction. It’s a fact the majority of Canadian kids are behind in skating, and puck handling compared to kids inEurope.” Acres would know, having a 9-year pro career mostly in Sweden and Finland. For more information about Bringing Smart Play to Hockey programs visit www.acreshockey.com and www.brainnavigators.com. After a busy week, I was just beat by Friday night. Have been working like a mad-man to get our new focus of the hockey schools up and running, Bringing Smart Play to Hockey, and all that that entails, making the transition from pro player to pro coach, more to come on both of these, and having my daughter, Emma sick and both kids at home all day, runny noses and the whole deal with that. Time management has been a huge issue this week. So, I finally took a break from the computer which is where I have been living, much to the chagrin of my wife, the last 2 weeks pretty much straight to actually watch the IIHF, Finland-Russia, semi-final game. The game progressed the first 25 mins without a goal or a penalty and then their was a goal. Oh man what a goal! 19-year old Mikael Granlund of Finland, well words can’t describe the goal! You have to see it to truly grasp how special a play it is. http://youtu.be/DlF6UvGEUKQ (Note to self: learn how to embed video in blog) He is just so fluid in his movement, what skill! The goalie didn’t have a chance. This is a player I have been following for about 4 years now since I first heard of this special player from the northern city of Oulu, Finland. I was playing and coaching in Helsinki and did some work for the Finnish Ice Hockey Association and was tipped off about a special talent that was being hyped as the best player to come along since Teemu Selanne. So, I asked around and found a clip of him on youtube http://youtu.be/Q2w5Q6yKk04 I could see right away he was special. He is actually more of a set-up man than a scorer, but there was no denying he was a creative, special player at that point only 15 years old. He was amazing for HIFK in the SM-Liiga Playoffs helping to co-lead the league in Playoff scoring and also to the Playoff Championship so I was excited to see him compete and succeed at the World Championships. I had no idea he would excel like he has in leading Finland to a berth in the Gold Medal game vs. Finland’s biggest rival and co-host of next year’s tournament, Sweden. I went to sleep with visions of his goal dancing though my head. Emma was up early, 5 am early and when she wakes, she lets the world know even when she is in perfect health. Well, with the time difference to the west coast of Canada being 9 hrs, a good time to try to reach a friend I have been trying to catch up with for a couple of weeks. I was so excited to talk about Granlund’s goal and other things. I am in luck, he is home and we have a good connection! Then he drops his bomb on me, have you heard? New York Rangers, Fwd, Derek Boogaard was found dead in his Minneapolis apartment. He was only 28! Boogaard was not known for his on-ice puck skills, he was a monster of a man, 6’7″ tall and one of if not the toughest of the tough guys in the NHL. He only scored 1 goal in the previous 5 NHL seasons. But like most tough guys he was soft as melted butter off the ice. Would do anything to help others especially children. I personally didn’t know the man but the hockey world is small and a recent teammate of mine played Jr. in Prince George, BC on the same line with him. “I used to pick up his gloves.” One of Boogaard’s best friends, goaltender Niklas Backstrom, became a star playing for Oulu-Karpat the same team that Granlund, played his Jr. hockey for. He and the “Boogyman” sat next to each other for 4 season as teammates in Minnesota. They were famous for ribbing each other and as I was looking on-line for more info on what happened I stumbled across a great quote from Backstrom on Boogaard breaking his 5 year scoring slump. “It must have been an end to end rush with him deaking to the back hand and roofing it.” Of course he was poking fun at his friend, but that was the first smile I had today when reading about this tragic event. I have been on the edge of tears today many times as I think about this and it has been bothering me all day. Boogaard missed most of this past season due to suffering a major concussion and I eagerly await the autopsy results to see if there is a connection. Share with your friends this exciting news about Acres Hockey Summer Programs for 2011. Click on the link to view and share our poster for Clinics offered in Co-operation with Progressive Goaltending Development during July 2011 on Vancouver Island, BC, Canada. I thought about the format I would like to take with this blog and came up with this. Since I have a website www.acreshockey.com , Facebook page www.facebook.com/AcresHockey , and Twitter @AcresHockey that tell you much about what I do professionally this should be more about me and the really important issues. Who I am and what I think about things going on in my world. Did I mention I live in a hockey bubble. Somebody got married this weekend and I guess it was a big deal? There is a federal election in my native country (Canada, presently reside in Sweden) on Monday? These are all things that yes, they have value but for me the important issues going on in the world are: will a Flyers goalie step-up to plate and grap the #1 job and lead them back to Stanley Cup Finals? How are the Canucks going to solve Pekka Rinne? How can I provide a value priced hockey school to my clients and still provide all the extras I like to while still making a profit? How can I help develop more pure goal scorers? Where am I going to play/coach next season? Is it time to retire and concentrate fully on being the best coach I can? Do I spent enough time with my family? What kind of future are my kids going to have? Am I teaching them the right things? How can I live in Europe and still remain somewhat connected to my friends/family back in Canada? These are some of the issues that run through my brain each day. I plan to try to answer some of these question and most defiantly welcome your opinions on these and many more thoughts that are constantly running through not just my head but all of us. So this is what this blog will be about, plenty of hockey related material and some instructional thoughts with a slice of Hank’s view on his world. If this is your cup of tea, please subscribe to the page and if you have better things to do that listen me, so be it. I will leave you one of my favorite quotes passed to me by one of favorite coaches, Scotty Atkinson.